Page Updated:- Sunday, 06 January, 2019. Above photos taken from Google maps May 2009. 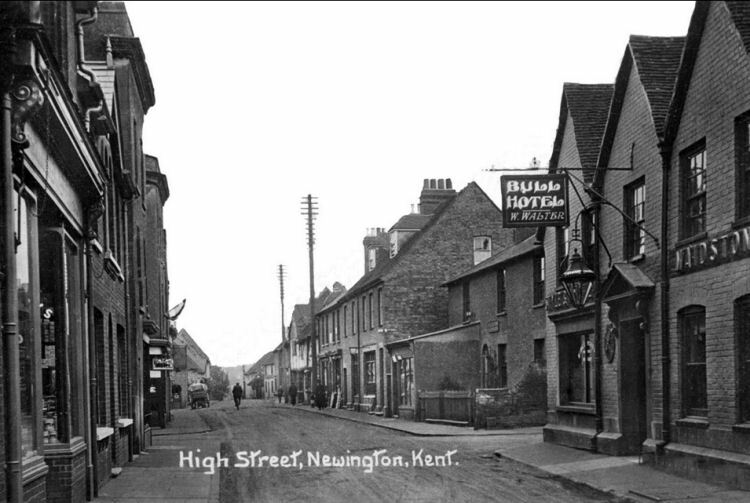 There is also a "Newington near Hythe"
The "Bull Inn" has links with a monastic past, albeit a sinister one. In the eleventh century, there was a community of nuns here, ruled over by the Prioress with a rod of iron. The holy lady was universally detested, and one night was strangled in her bed. As the murderer was never caught, all the nuns were condemned to be buried alive in a local chalk-pit, thenceforth known as Nun Pit. So the story goes. Kentish Gazette, Wednesday 3 May 1755. To be Sold by Auction, by John Wright, Auctioneer, on Thursday the 4th day of May instant, and the two following days. The household Goods, Plate, Linen, China, and Wearing Apparel, of Mrs. Ann Aggar, lately deceased, at her dwelling house, the Sign of the "Kings Head," at Blue houses, Sheerness; consisting of Four-post Bedsteads with Check Furniture; Goose and other Feather beds, Quilts, Blankets, and Counterpanes; Mahogany Chairs; Card and other Tables, Looking-glasses, and great Variety of Kitchen Furniture; fine China; a great Quantity of Linen and Wearing Apparel. Catalogues to be had at the "George" at Queenborough, the "White Hart" at Milton, "Red Lion" at Sittingbourne, "Ship" at Faversham, "Bull" at Newington, "Cricketers" at Rainham, "Kings Arms" at Minster, and the Place of Sale, at John Wright's Chatham, and at Fishers Printing office, Rochester. The sale to begin each day at 10 o'clock; the Goods to be viewed the Day before the Sale, and to the time of Sale each Day. Kentish Gazette, Friday 29 May 1789. To be sold by auction, By John Batten. On Monday the 8th day of June, 1789, between the hours of 4 and 6 o'clock in the afternoon, at the sign of the "Bull" at Newington. All those several Pieces or Parcels of rich Arable and Pasture Land, containing by estimation 13 Acres, be the same more or less, situate and lying at South Dene, in the parish of Stockberry, in Kent, now in the occupation of Mr. William Smith, as Tenant from year to year, at the very low rate of £6 6s. per annum. Particulars may be had of J. Simmons, Attorney at Law, at his office, on St Margaret's bank, next Rochester. From the Faversham Gazette, Saturday 25 August 1855. NEWINGTON HORTICULTURAL AND FLORAL SHOW. On Wednesday last the show of this society took place at Newington next Sittingbourne. The specimens were displayed in a spacious booth erected in the yard of the "Bull Inn," reflecting great credit on Mr. John Harris, who superintended the arrangements, and the whole of the flowers, fruit and vegetables, would have done credit to the exhibitions of much greater pretensions. The judges were Mr. Terry, Rochester, and Mr. Samuel Harris, of Upnor, who gave general satisfaction. 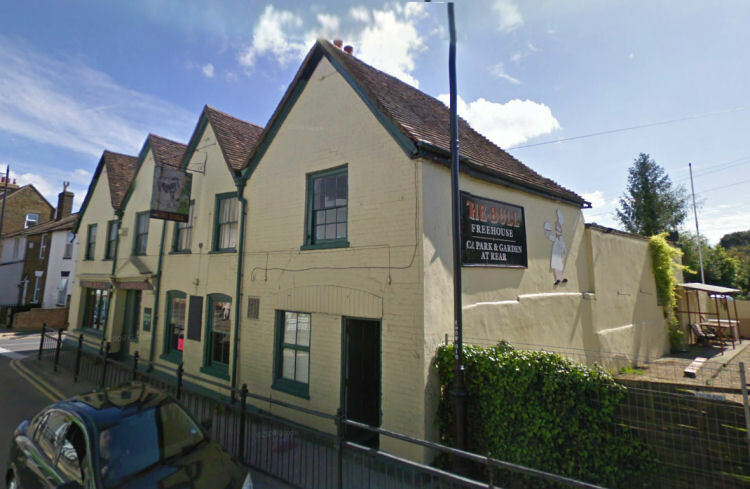 After the exhibition, the members and friends partook of supper, served up in good style by Mr. Atwood, the landlord of the "Bull Inn," and the party separated well pleased with the day's entertainment. From the Maidstone Telegraph, Rochester and Chatham Gazette, Saturday 27 April 1861. 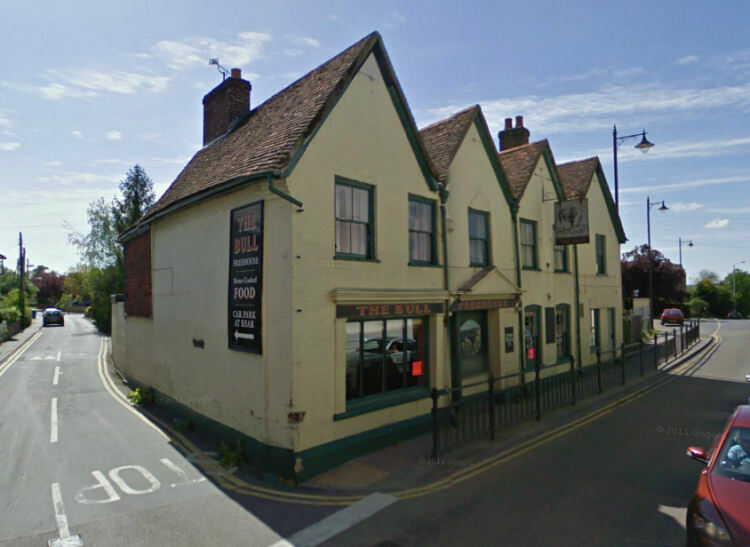 William Coningsby, of the "Bull Inn," Newington, was summoned for having his house open during the prohibited hours on Good Friday. Whitstable Times and Herne Bay Herald, 25 June 1870. On Tuesday morning the body of Isaiah Boakes, 23, was found hanging on a cherry tree at Newington, and afterwards removed to the "Bull Inn," where an inquest was held on Wednesday, before T. Hills, Esq., coroner, and a respectable jury. The principal witness was Emma Spenton, who was accompanied home by deceased on Monday evening. They had been at a school treat in a meadow together, and after it was over the deceased and witness were at a party in the "New Inn." Witness was with two other young men, and deceased offered her some beer, which she refused. He afterwards walked home with witness and her sister, and the sister left them together and walked on. He was rather rough to witness, and seemed reluctant to bid her good night. On getting home she heard somebody at the back, and some pencilling was found in an outhouse, in which somebody (probably deceased) asked her to follow him to the grave. Deceased seems to have wandered about and made an ineffectual attempt on his life with a knife, which was subsequently found in his pocket. He was ultimately cut down in an orchard, having committed suicide by hanging, and been dead about two hours. The Coroner commented on these facts, and the jury immediately returned a verdict of "Temporary insanity."